What the Heck is a Monkey Bike? Those who live near the coast could probably explain a “grom”, or “grommet”, is slang, sometimes derogatory, for a young surfer. In some quarters, “grom” is the surfing equivalent for “squid” in motorcycle parlance – a term with similar SoCal roots. Likewise, those who are familiar with motorcycles from the ’70s and ’80s can explain Monkey was the common name given to the Honda Z-series, a line of small, almost toy-like, minibikes powered by 49cc engines. 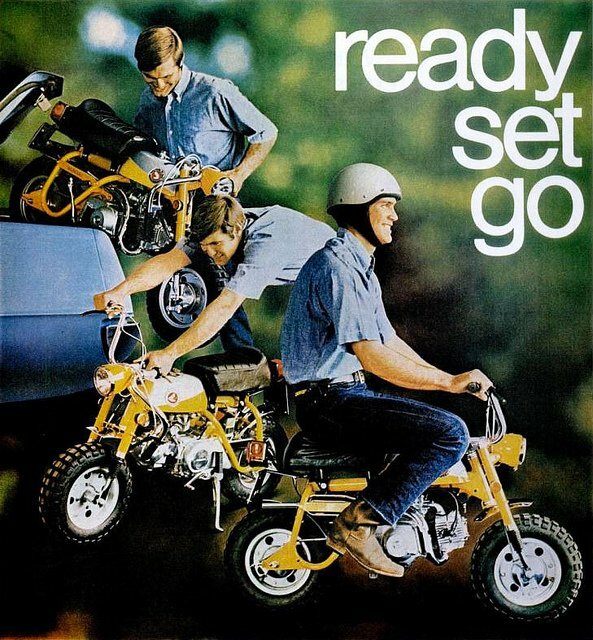 The original Honda Z100 was tested at an amusement park, of all places, back in 1961. 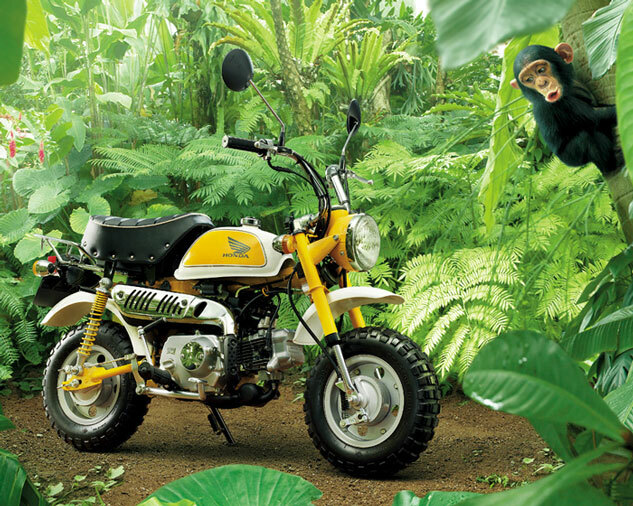 More than 50 years later, the Honda Monkey Bike remains in production. 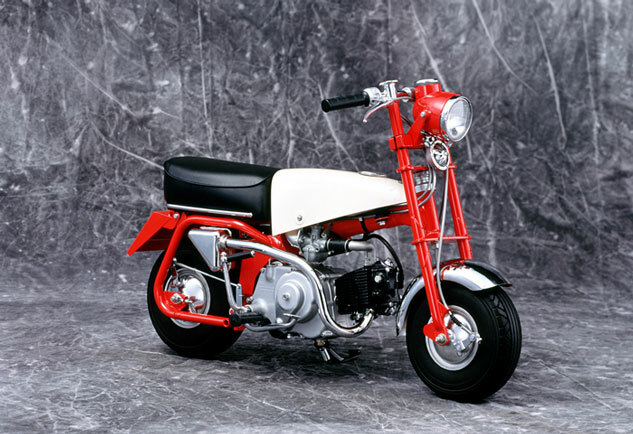 In 1964, Honda introduced a street-legal production version called the CZ100, but it wasn’t until 1967 that Honda began exporting Monkey Bikes in large volumes to Europe as the Z50M. The Z50M sported a similar red frame and white fuel tank with matching fenders and a plaid seat. The seat could be lowered and the handlebars were collapsible, folding down by loosening a couple of knobs to make the Z50M compact enough to stow away easily. The 49cc engine was paired with a three-speed transmission with an automatic clutch; gear shifts were performed by rolling off the throttle and toeing the shift lever. The first Monkey Bike to arrive in the U.S. was the 1968 Honda Z50A. It lacked lights and mirrors so it wasn’t street legal, but it did have a suspended fork. 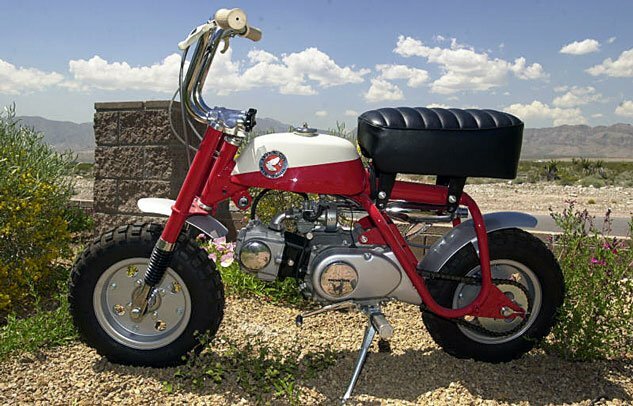 The Monkey Bikes didn’t arrive in the U.S. until 1968 when Honda imported the Z50A, also known as the “Mini Trail.” It featured a two-tone fuel tank, chrome fenders, white grips, 8-inch wheels and, for the first time in the Z-series, front suspension. Missing a headlight and turn signals, the Z50A wasn’t street-legal for the U.S. until Honda added a lighting system for 1969 onwards. Over the ensuing years, the Z50A gained more new features, many of which we take for granted as standard equipment. In 1970, the Z50A gained a longer fender and a foot brake lever. Two years later, the Z50A received a substantial update, getting a new frame, new seat, a redesigned gas tank and dual rear shocks – rear suspension! By lowering the seat and folding down the handlebars, the Z50A fit easily into the back of a car, though it took a bit of effort to lift it. Honda continued to offer the Z50A in the U.S. up until 1979 when it was replaced by the Z50R. Featuring a new seat, fuel tank and BMX-style handlebars, the Z50R was sportier than its predecessor as owners started taking their Monkey Bikes to the track. The Z50R was designed for racing so it lacked lighting that would make it street legal. Meanwhile, in Japan, the Monkey Bike took a different evolutionary path with the model designation Z50J, introduced in 1972. In 1978, Honda introduced a larger version of the Monkey Bike, the Z50J-III, aptly named the “Gorilla.” It featured a four-speed manual transmission and a larger fuel tank. 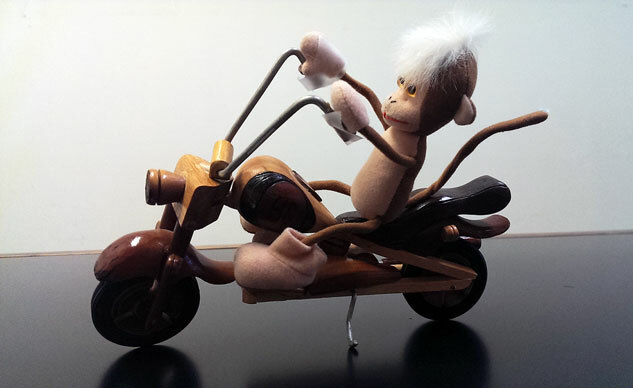 The handlebars were also fixed and did not fold down as they did on the Monkey. The Gorilla was discontinued in 1990 but was resurrected eight years later. Production continued for several years before it was again discontinued in 2007. 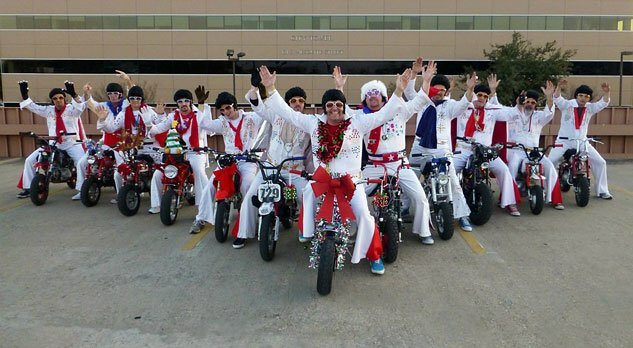 Honda Monkey Bikes are the motorcycles of choice for the World Famous Wheelie-ing Elvi stunt show. The U.S. market lacked a street-legal Monkey Bike until 1988 when Honda introduced the ZB50. The ZB50 was a significant departure from the other Monkey Bikes as it used a perimeter twin spar aluminum frame, monoshock rear suspension and upswept exhaust, giving it more of a sportbike appearance. Other markets had a similar model called the Monkey R that had disc brakes replacing the ZB50’s drum brakes, as well as the Monkey RT which swapped the semi-automatic three-speed transmission for a four-speed gearbox with manual clutch. Unfortunately, these twin-spar framed Monkeys proved to be too expensive to produce and they were discontinued after just a couple of years, making them extremely rare collectors’ items. The Z50R remained in Honda’s U.S. lineup until 1999 when it was replaced by the XR50R, the predecessor to the modern CRF series of dirtbikes. In 2001, Honda released a new member of its primate family with the Ape 50 for the Japanese market. The Ape 50 used a 49cc Cub engine in a XR80R frame. 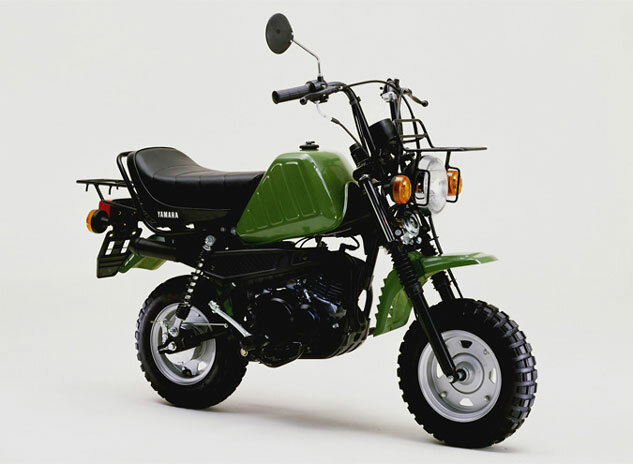 A year later, Honda released a 100cc version called the Ape 100. Both models are still available in Japan, though the Ape 50 was upgraded with a fuel injection system in 2007 to comply with local emission regulations; the Ape 100 remains carbureted. The Z50J Monkey Bike remains a part of Honda’s lineup today. The Z50J Monkey is also still in production for the Japanese market today. The Z50J was briefly discontinued in 2007 but returned in 2009 with an electronic fuel injection system and catalytic converter to meet emission requirements. It is also equipped with a manual four-speed transmission. Other manufacturers have introduced their own interpretations of the Monkey over the years. The Yamaha Vogel QB50 was one of most similar competitors. It featured a 49cc engine, four-speed transmission and knobby 8-inch tires. The Yamaha QB50 was similar to the Z50. Instead of using primates, Yamaha named it the Vogel, the German word for “bird”. Like the Z50, its handlebars were collapsible for easy storage, but the Vogel was equipped with a 10-liter fuel tank, offering more than twice the capacity offered of the Z50’s 4.3-liter tank. The Vogel did not have the staying power of the Z50, however, getting discontinued in 1983. The 2014 Honda Grom is a continuation of the Honda Monkey heritage. Using a 125cc engine sourced from the Honda Wave, the Grom is larger than the original Monkey Bikes. Its seat height of 29.7 inches is higher than the modern Z50J’s 26.0-inch seat height, and its claimed weight of 225 pounds is 150% heavier than the Monkey. 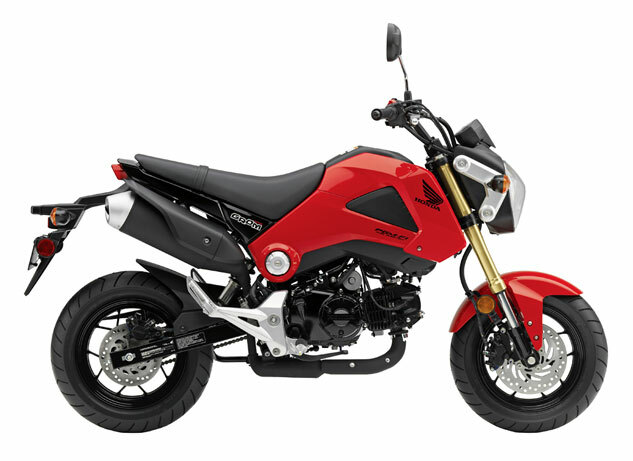 The larger size is what makes the Grom a viable model for the U.S. market where the Z50J would likely be deemed too small. The 2014 Honda Grom is the latest member of a long tradition of quirky Honda minibikes. Still, the thick tires, exposed single-cylinder engine and four-speed transmission are reminiscent of the Z50, and the Grom inspires similar reactions from people as its simian predecessors.